I’m going to be bringing more parents onto the TiLT Parenting Podcast so we can all be inspired by learning about the different ways moms and dads everywhere go about meeting the needs of their unique kids. 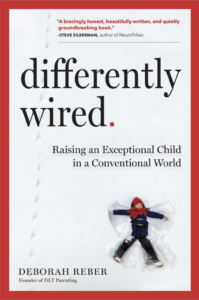 In this episode, I talk with Jill Emmelhainz, the mother of a 14-year-old differently-wired daughter who struggles with severe anxiety. Over the years, Jill and her husband noticed their daughter Anna’s anxiety was greatly reduced when she spent time outdoors and in nature, so this past year, they decided to try something radical and fully immerse themselves in nature for extended periods of time to see what would happen. For six weeks in fall 2015 and five weeks in spring 2016, Jill and her daughter have hiked the Appalachian Trail in the eastern U.S. The result? During those weeks in nature, Anna’s anxiety all but disappeared, and she’s found ways to bring the learnings from those experiences back into her day-to-day life in a helpful way. JIll and her daughter’s story is fascinating…we have a sense you’ll think so, too! I loved this episode – so inspiring!